The Spanish city of Girona (Spanish name Gerona) is located in the north-east of Catalonia, about 30 kilometres from the Mediterranean Sea as the crow flies, where beautiful beaches of the Costa Brava await holidaymakers. The history of Girona goes far back in time to the Romans, who shaped the cityscape, which can still be seen today, especially in the old town. If you want to rent a car in Girona, you will especially enjoy driving a convertible along the coast. The French-Spanish border in Le Perthus can be reached by rental car from Girona after about 62 kilometres. The nearest airport is Girona International Airport (GRO), which can be reached by car in 20 minutes from the centre of the village, about 13 kilometres away. Barcelona Airport (BCN) is about 120 kilometres away. Girona measures an area of 39.14 square kilometres, which is home to almost 100,000 inhabitants. The tranquil city attracts thousands of tourists every year. Peace and relaxation as well as culture and entertainment are equally offered. Here, land and beach holidays can be optimally combined. Above all, Girona offers culture lovers and individual travellers a perfect starting point for exploration trips with a rental car, which can be booked cheaply via the comparison portal of Driveboo. As a Catalonian province between the French border and Barcelona, Girona is a perfect starting point for countless excursions to get to know the country and its culture. Here it is advantageous to obtain offers for car rental in order to be able to experience the country independently in its very special way. The village of Castillo de Aro located on the Costa Brava, is about 30 kilometres away from Girona City and can be reached by rental car. The village of Castillo de Aro is always worth a visit. The beach Playa de Aro has been awarded a seal of quality and is one of the most beautiful beach regions in Spain. Impressive is the village idyll of the listed village, which a defensive fortress was built around. The castle Castillo de Benedormiens from the 11th century is also worth a visit. The ancient alleys of Castillo de Aro exude a very special charm. The old stone houses show the traditional architecture of Catalonia. In the Museo de las Munecas, there is a doll museum whose old collections are impressive. These destinations on the Costa Brava, in Spain, can be easily reached by rental car. About 50 kilometres from Castillo de Aro and Girona, next to the tourist centre of Lloret de Mar, lies the town of Blanes, which belongs to the province of Girona. Here, next to the historic centre, you will find the Sant Joan castle, the Gothic palace of the Counts de Cabrera and the fountain of the Carrer Ample, which can be easily reached by rental car. Lloret de Mar itself is especially popular with younger holidaymakers. 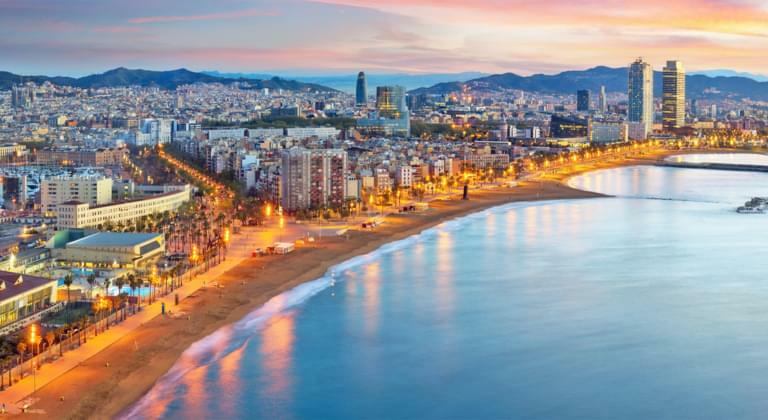 It is only a few minutes by car from Blanes to Lloret de Mar, famous for its lively nightlife, beautiful beaches and great party atmosphere. Those interested in culture should not miss to visit the castle Castell d'en Playa. The ascent is directly on the beach. The efforts of the numerous steps are rewarded with a breathtaking view over the sea. In the city centre is the 16th century Parish Church of Sant Roma, which boasts exceptional architecture. Renting a car does not mean being tied to land routes. Car ferries commute several times a day from Barcelona to Mallorca. It is worth combining an excursion to Mallorca with an adventure tour through the world metropolis Barcelona. If you want to rent a rental car, you should not miss the breathtaking view over Barcelona from Mount Montjuïc. In the city centre, the rental car can be parked at the Plaça de Catalunya traffic junction and a journey through time can be undertaken on foot to the Roman ruins, the medieval city centre and the planned city of Eixample. The promenade La Rambla is the most famous street in Barcelona, which runs along the famous opera house Gran Teatre del Liceu in the direction of the port. On Mallorca the ferry arrives in Alcudia. Various offers offer the crossing in 8 to 10 hours. From there it is possible to continue to Palma de Mallorca in about 45 minutes by rental car . The fascinating bell tower or the Roman theatre are only two examples of the numerous sights in Alcudia. If you like hiking or climbing, you will find a perfect place in the Tramuntana Mountains, located to the northwest. The old town of Alcudia on Mallorca invites you to go shopping in an old town flair. The crossing from Valencia to Ibiza takes about five hours. Arrival is in St. Antoni de Portmany. This is the largest city on the western coast and has a modern coastal ambience. The beach S'Arenal of St. Antoni is enchanting and easy to reach by rental car. The " Egg of Columbus" is here. It is the landmark of St. Antoni and should not be missing from any list of sights. We continue by rental car in the direction of Ibiza town, which is about 20 minutes away from St. Antoni. Above the rooftops of Ibiza town is the magnificent Santa Maria Cathedral, which, when on top, offers an impressive view over the surroundings. The museum in the old town of Ibiza displays contemporary art. With the rented car from the car rental company you can continue to the mystic rock island Es Vedrà. The remains of the once sunken city of Atlantis are said to lie here. The ferry is a 30 minute drive from Ibiza town. Here you can book offers for guided tours to the rock island. Valencia is located 320 km southeast of the capital Madrid on the Mediterranean Sea. Besides wonderful beach holidays Valencia offers numerous sights. Whether the silk fair in profane Gothic style or the cathedral of Valencia from the 13th century, Valencia counts numerous sights. It is also home to Europe's largest aquarium, L'Oceanogràfic. The flowery parks offer pure relaxation. Madrid is the capital of Spain and impresses with an architectural mix of antiquity and modernity. It is one of the largest metropolises in Europe and offers holidaymakers a wide range of entertainment and business opportunities. Also impressive are the business centre on the Paseo de la Castellana, the highly developed streets Alcalá and Gran Vía, the Palacio de Cibelesl and the overwhelming cathedral Almudena in the style of neo-classicism. By car, it is worthwhile to drive along Calle de Alcalá, a magnificent street with numerous buildings from the Wilhelminian period. Here in Madrid, for example, you could end your round trip with your own rental car from Girona. The return journey would be by plane from Madrid-Barajas airport, which is about 15 minutes drive from the centre of Madrid. If you return to Girona by rental car, you have over 700 kilometres to go to the centre of Girona. If you want to rent a car cheaply from a car rental company in Spain, you should take advantage of offers that are cheap, but additionally include offers of standard insurance cover that may cover accidental damage to the injured party. In order to be well insured in Spain in the event of damage to the rental it is advisable to take out additional insurance. Offers for supplementary insurance are available from many providers at low prices and can also be booked online. When taking over a rental car offer in Girona, it is important that all existing paint or body damage is recorded by the car rental company so that it cannot be attributed to the car rental company at the end of the rental period. When renting a rental car in Girona, it is important to have a safety vest. In Spain, this obligation must be met in the event of a breakdown or traffic accident. Renting a car directly at the airport in Girona, Madrid or Barcelona is more expensive than booking via Driveboo. It is worthwhile to rent a car for Girona via the car rental comparison portal, whose offers can be viewed online, even before you start your holiday. Here, in addition to renting a vehicle for Girona, offers can also be obtained for additional insurance cover and corresponding insurance policies can be taken out online without any problems.